The connection between Eliot Liburd as Amir and Matthew Greenhough (who is also the writer) as Dean is total and transfixing. They are equally playful and believable, and there are some wonderful lines that really tickle. Conversations about ideological motivations contrast with prosaic memories of Wetherspoons and overpriced WHSmith meal deals, and elide with talk of intifada, faith and colonisation. The juxtaposition is often extremely comic. Yet the play remains illuminating, touching upon young masculinity, capitalism and the appeal of violence and belonging. Banter about the North-South divide back in Britain brings the two young men closer together. At the opposite side of the war in the Middle East, there is documented evidence of guards in Guantanamo Bay meeting up with the British captives they befriended post-release. Whether a bond of sorts ever developed between men acting out the same dynamic at the other side of this war is, of course, unknown. It doesn’t matter – this theatrical dynamic is designed purely to explore the shared humanity in men who exist in different worlds and in this it is highly successful. Our knowledge that many of those who join the Islamic State are British lends credibility to the situation portrayed, and the characterisations of both men are persuasive and detailed. Theatre Royal Stratford East picked up Wound Up Theatre’s Bismillah! 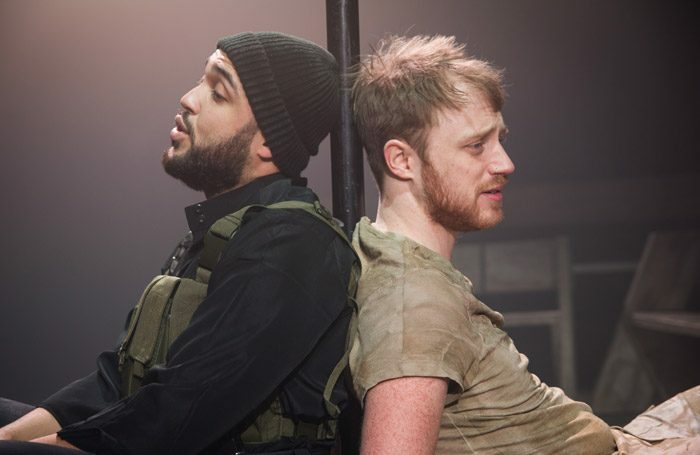 An ISIS Tragicomedy following its award-winning run in Edinburgh. Further development with director Jonny Kelly has eliminated the need for another guard, meaning that Amir’s motivations are all his own. The damp, spare depths of the VAULT Festival in Waterloo lends the play an immersive feel. This is a well-directed piece, which is thoughtful and pacy, whilst patiently managing to unpack some of the complicated issues at its core. We aptly follow the stories of two young men who pine for love, financial security and acceptance and who therefore choose to join a shared adventure which does not match their expectations. Entertaining, vital stuff. Bismallah! An ISIS Tragicomedy runs through 4 March.